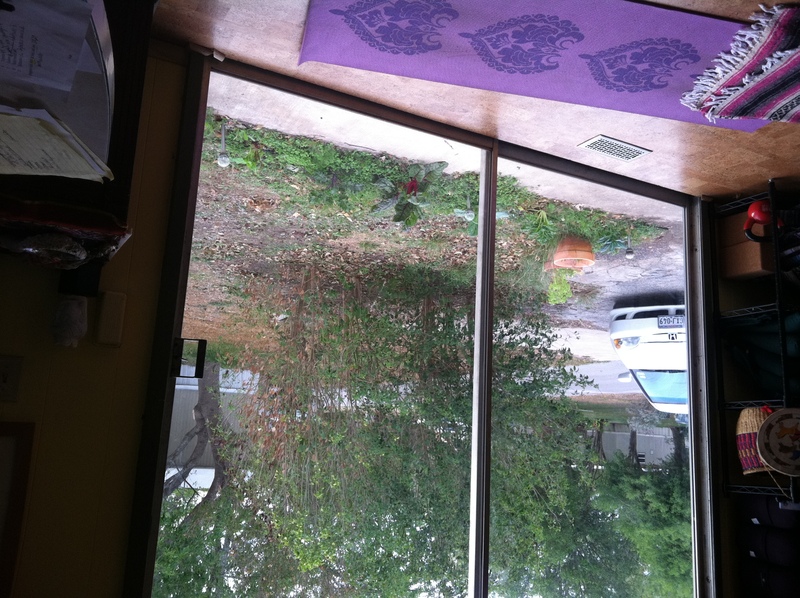 And…my trailer now has sliding glass doors! If you’ve been keeping up with progress on my Spartan Carousel trailer, when I bought it in February, it had a set of non-original sliding glass doors at the entry-way. They were too small to fill the space, and a previous owner had put a piece of particle board in the gap to fill up the space. You can see them in the photos to the right. The aluminum frames for the original doors were inside the trailer when I got it. Unfortunately, through some miscommunication, a helper that my handyman had hired to help him did not know that the frames were original, unique, and valuable, and he discarded them, thinking they were junk, before we got around to working on that particular problem. Just trying to help, you know. I felt sad about the loss, but what could I do? Forgive, because he really didn’t know any better, and move on. Ian let him know it was a mistake to assume he could discard anything, and he was properly abashed and worked really hard after that. I’ve been using the back door to get in and out this whole time, since late June. This past week, Ian found a pair of wide sliding glass doors at the Habitat for Humanity Re-Store. They seemed to be a little bit too wide for the door frame in my trailer, which is riveted into the metal frame and shell and can’t be adjusted without huge expensive work being done. He asked me if I wanted to take a risk for $60 that he could make the doors work. Heck yeah! If they didn’t work, we would have learned something, and I could redonate them as a charitable deduction. Between measuring and re-measuring, consulting with the pros at Binswanger Glass (who could have cut the frame but not the safety glass), and trips to The Home Depot for the right kind of rollers, Ian got the doors in. They fit almost perfectly and are completely functional! The latch is in the right place. There’s a little bit of overlap (half an inch) where the doors meet in the center, and with weatherstripping, it’s good enough. I can live with that. The only problem remaining is figuring out what needs to happen so that the doors can be locked and unlocked from the outside. To have new custom doors made and installed would have cost about $2,000. This solution cost under $350, with most of that being labor. Ian is now a magician in my book who can do just about anything! The photo shows the mixed border I planted with purslane and greens, the pots of aloe and basil, the solar lights, and the stand of ligustrum that was here when I moved in and seems planted catty-wampus to me. They aren’t native, so I didn’t water them during the worst of the drought, and one is dying. I’d like to eventually do some more pleasing landscaping with native plants out front. So now about half of my living room walls is windows. I’m still working on getting window coverings. I have a call into Budget Blinds — big thanks to Katie Ford for that referral. And an entry deck will be built soon! This entry was posted in breakthrough, gratitude and tagged Binswanger Glass, Ian Allan, Katie Ford, sliding glass doors, Spartan Carousel, Spartan trailer, The Home Depot by MaryAnn Reynolds. Bookmark the permalink. Beautiful! You’ll be able to watch the moon and the stars and the rain…and your smokin’ chimenea! Awesome Mary Ann! I had noticed the smaller non-original doors in the original “for sale” listing. Good for you for switching them out! Yay, more light and more ventilation options! Jessica, thanks for commenting. How’s your Carousel remodel coming along? Thank you for sharing, Laura! This is awesome! Mine had walnut paneling, which I painted yellow. One future project is to take it down, reinsulate and rewire, and replace it with birch paneling. Another great Carousel for sale. Check out the interior shots. I have no idea. That’s a bit much, but I wouldn’t be surprised if they appreciate that much. These are rare models that aren’t being made any more, and still pretty much a bargain compared to buying a small house of comparable square footage.